The Cavs, like everyone else in the NBA, have no readily available solutions to stop Kevin Durant and the Warriors. Cleveland was locked in from the opening tip against Golden State on Monday night. Players were flying around on defense. LeBron James scored 16 points in the opening quarter. And the fans helped create an atmosphere not unlike a playoff game. None of it mattered. 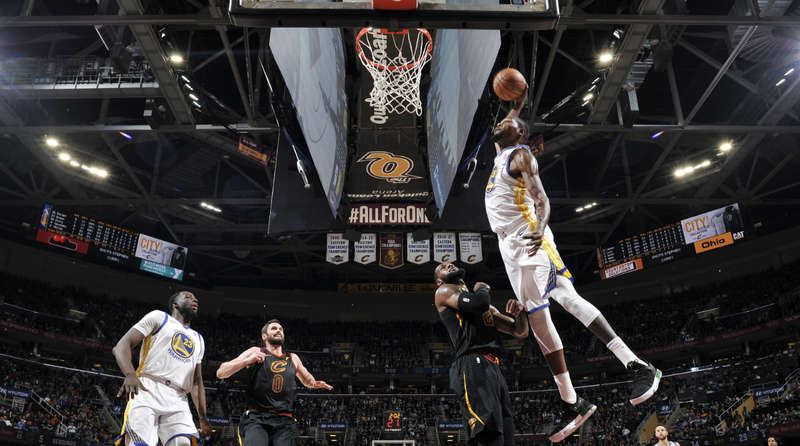 The Warriors still left with a double-digit win, completing a season sweep of the Cavaliers with a 118–108 victory. If the Cavs hope to avenge these defeats, they’ll have to wait until a potential Finals rematch, for which they’ve given no indication they’ll be anything besides substantial underdogs. There’s one extremely obvious issue for Cleveland whenever it plays Golden State: Kevin Durant, who scored 32 points on 9-of-16 shooting Monday. Durant’s length on both sides of the court gives the Cavs fits, and it looks like LeBron and Co. have zero answers for KD. On the offensive side of the ball, a complete performance from Durant is enough to overcome average performances from Stephen Curry and Klay Thompson. Steph and Klay still played very well Monday, but Thompson cooled off after a hot start, and Curry never really put his stamp on the game the way he typically does with his three-point barrages. Of course, the defensive attention on the backcourt makes Durant’s life easier, and he took full advantage against the Cavs, attacking relentlessly. Cleveland simply has nobody to guard Durant. Even James, who has been the ultimate defensive counter for his entire career, doesn’t seem to have the length to truly bother KD from getting any shot he wants. Durant’s frame created just as many issues for the Cavs’ offense. Cleveland scored well for stretches on Monday, but their offense was often bogged down by Durant. KD’s playing the best help defense of his career, and his presence in the paint clearly discouraged Isaiah Thomas from shooting on numerous occasions. That’s notable, because while Thomas should be enough for Cleveland to make it through the East in the playoffs, he could be a significant downgrade from Kyrie Irving specifically in matchups with Golden State. Thomas’s height was rarely a problem last season, but it appeared to catch up with him a bit on Monday. Thomas, typically a great finisher, had stage fright every time he saw Durant in the paint, and the Cavs lost easy looks they would normally have against other teams. When the Warriors won 73 games in a season, they were still vulnerable in the Finals, thanks in large part to LeBron’s individual brilliance. As has been obvious for the last season and a half however, Durant takes the Warriors to what seems like an unstoppable level. On his own, KD is a nightmare matchup. Surrounded by two of the best shooters in NBA history (Curry and Thompson) and one of the smartest players in the league (Draymond Green), Durant becomes unguardable. The Cavs, like everyone else in the NBA, have no readily available solutions. If Cleveland’s trade to acquire Paul George in the offseason hadn’t fallen through, it’s possible the conversation is slightly different right now. George could have given Cleveland the defender needed to slow down KD, while also helping ease LeBron’s burden on offense. As currently constructed, the Cavs’ decision to play five perimeter players isn’t helping them defensively against Golden State, and they haven’t proven they can keep up offensively as well. Someone like DeAndre Jordan could provide some slight relief, but he’s hardly enough to flip the conversation. For now, barring any serious moves that add length and defensive ability to the perimeter, Cleveland doesn’t look like it can overcome its Durant problem any time soon. And as is the case for most of the league, the gap between the Cavs and Warriors only appears to be widening.